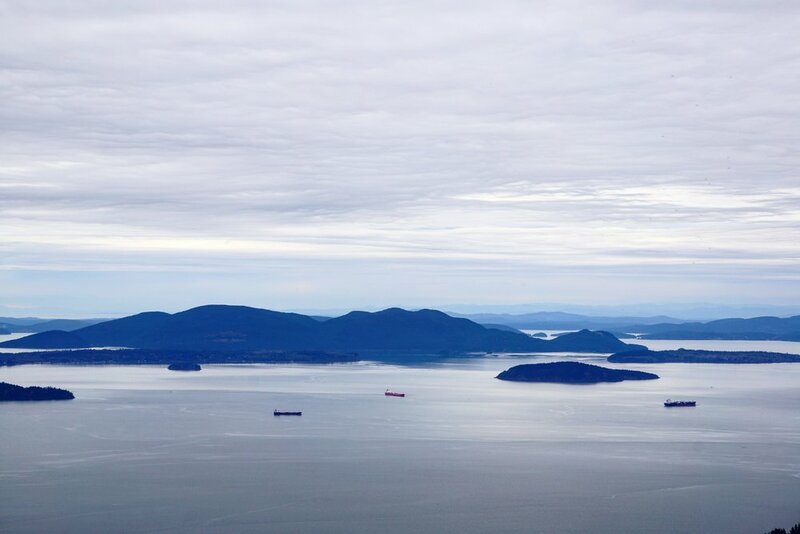 Overlooking the San Juan Islands, with views all the way to the Olympics, Oyster Dome provides an opportunity for some gorgeous scenery. The location is in the second-growth Blanchard Forest, on Chuckanut Mountain. This area was extensively logged in the mid-1800s until the land was deeded to the state in 1925. Today, the Washington State Department of Natural Resources provides diverse recreation opportunities here and in the surrounding areas. We hiked the 6.5 mile roundtrip trail on a rain-free, partly cloudy day in March with temperatures in the low 60s. Located about 10 miles northwest of Burlington and 10 miles south of Bellingham, the trailhead is directly off of WA-11/Chuckanut Dr., just south of Larrabee State Park. We visited on a Saturday afternoon and the road was lined with parked cars. Nearly all of the available shoulder parking is on the right hand side as you head south along WA-11. Be prepared to parallel park quickly. This is a busy, narrow highway with vehicles flying by. The shoulder provides just enough room to park on the other side of the white stripe with the land steeply sloping downwards from there. The driver should use extreme caution when exiting. Folding in your mirror is also suggested. Just north of the trailhead, on the west side of the road is Oyster Bar. The parking lot for it was pretty full, with a few available spots. However, there was a sign indicating that it was to only be used by customers. Surely the majority of the parked cars there were hikers. We didn't risk it. Some vehicles had their Discover Pass displayed, others did not. We don't believe you need your pass here but it doesn't hurt to show it. If you're parking in another location, within the forest boundaries, you will need a pass. Finally, depending on where you parked you may have a bit of a walk to the trailhead. That's not a bad thing since the trail immediately begins a steep incline. If you like to stretch before hand, now's the time. Steeped in steepness, this trail is about a 1,900 ft gain in just over 3 miles. At the trailhead is a sign indicating PNW Trail. Beyond that there's another sign indicating the same thing but also listing all the connecting trails, including Oyster Dome. Further up is an information board with an overview map of all the trails in the area and according to it, you're actually on Chuchanut Trail. You'll also see a large rock with chiseled information on it and a nearby "Rock Talk" messaging center for thru hikers of the Pacific Northwest Trail. A set of steep switchbacks make up the first 1.5 miles of the trail. While gaining elevation you can see the road below and hear the busy sounds of the traffic. Those sounds will quickly fade as you climb up. Along the way we spotted signs of Spring in the form of blossoming berry bushes. The trail is rocky and root filled here but well maintained. We passed by numerous other hikers. Some solo, some in pairs, and some in groups. There were trekkers with poles, dogs, and children. Several of the groups, we assume, were college students. This is a pretty popular trail for them. Toward the end of this section, around the bend of the last switchback, there's a short portion that we would describe as being very steep. It's doable, but it certainly made us take a break to catch our breaths and drink some water after reaching the top of it. After that break the trail begins to level out and we reached a spot with a bench and small clearing that overlooks Samish Bay. This area was already occupied by 5-8 others so we quickly snapped a few photos and moved on. The next waypoint is moving from the Chuchanut Trail to the Samish Bay Trail. You'll take a left here to continue to Oyster Dome. If you make a right it'll take you to Samish Overlook which isn't too far out of the way. We were running short on time and decided to save that for the next trip. Hiking along this portion had us crossing over a few small creeks and crouching under a large downed tree. Some people decided to go up and around the upturned root system, but it was much quicker to get just a little bit dirty by going under. This was the second of two downed trees that crossed the trail. There were a few muddy spots, but we didn't encounter anything impassible. Soon enough we passed by a very large boulder and then the trail began another set of switchbacks. At the top of those you'll make a left, cross over a small stream, and begin hiking up some more. This last portion felt like it would never end. Finally though, we reached the top. Once getting close to the top we somehow found our way off trail and headed north rather than west. That was ok though. There was a large boulder to stand on which provided views all the way across the Canadian border of the mountain ranges north of Vancouver. We were also the only ones here. We eventually found our way to everyone else. Here was a number of other hikers taking in the views and enjoying the break of reaching the top. There were several somewhat level areas that provided an outlook over the Sound and gave room for everyone to spread out. We took the opportunity to hydrate, rest and have a snack. You'd be hard pressed not to be wowed by how far into the distance you can see. This was a partly cloudy day and a bit hazy, but I swear we could see a moose in Canada ;-). This out of the way hike provides incredible views. The views are an excellent reward for the effort of hauling yourself ever upward. For being just the beginning of Spring, there were already quite a number of others on this trail. In summer this one is probably a bit congested. It is a trail we will happily return to. There is more to see and hike in this area and parking aside, it's easily accessed. While we were two among a much greater number, we still had brief, peaceful moments surrounded by forest and rock. We're happy to have hiked this one and look forward to returning.